History was made at Buckingham Palace on Dec. 11 when a Sikh soldier became the first guardsman to wear a turban instead of a traditional bearskin [hat]. Jatinderpal Singh Bhullar, 25, was allowed to break nearly 200 years of tradition to wear his religious headdress while on official duty. “Conducting public duties while being a practicing Sikh and wearing my turban is a great honor for me,” Bhullar said. Bhullar joined the Scots Guards regiment last year. Like all the guardsmen at Buckingham Palace, their uniform normally includes the black bearskin cap, which [has been worn since] 1832. Other Sikhs have been part of the Queen’s guard in the past, but they, too, wore bearskins. There had been some backlash against Bhullar’s desire to wear his turban while on duty and this exemption from wearing the bearskin was criticized by some former members of his regiment, the London Evening Standard reported. But Bhullar had strong public support and the backing of the British Ministry of Defense. “We welcome the additional diversity,” said his Commanding Officer, Lt. Colonel Robert Howieson. “Guardsman Bhullar will join brother Guardsmen of a wide range of ethnicities, religions and denominations. When Guardsman Bhullar marches onto Buckingham Palace Forecourt for the first time, we, his regiment, will be very proud of him as he writes another chapter in our long, distinguished history,” Howieson said. 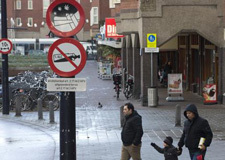 A sign prohibiting the use of marijuana in a designated area is seen in Amsterdam, Wednesday Dec. 12, 2012. Amsterdam’s mayor said Wednesday he would formally ban students from smoking marijuana at school as of Jan. 1, making the the Dutch capital the first city in the Netherlands to do so. AMSTERDAM | Amsterdam’s mayor said Wednesday he would formally ban students from smoking marijuana at school, making the Dutch capital the first city in the Netherlands to do so. Eberhard van der Laan’s introduction of a law that in other countries either already exists or seems so obvious it wouldn’t even require a rule is the result of the Netherlands’ unique drugs policy. Under the ‘‘tolerance’’ principle, marijuana is technically illegal here, but police can’t prosecute people for possession of small amounts. That’s the loophole that made possible Amsterdam’s famed ‘‘coffee shops’’ – cafes where marijuana is sold openly. But it has also had the unwanted side effect that Dutch children are frequently exposed to the drug in public areas. After a change in national law, the city will now be able to declare as of Jan. 1 ‘‘no toking zones’’ – areas like schools and playgrounds where weed-smoking is forbidden – under a public nuisance ordinance. Police can then levy fines against students or anybody else who flouts the rules. The move is closely paired with a decision by the new government to ditch plans for a national ‘‘weed pass’’ that would have blocked tourists from buying marijuana. That was a measure years in the making, and greatly desired by southern cities such as Maastricht that have been flooded with dealers from Belgium and Germany who drive across the border to buy weed in bulk. But the weed pass was opposed by Amsterdam, where drug tourists are not generally seen as causing many problems. Last month, Van der Laan proclaimed that coffee shops would stay open for tourists after all. In a letter Wednesday, he noted that one in three tourists who come to Amsterdam try marijuana while they’re here, more than previously estimated. NOTE: Currently, the legal age to buy tobacco in the Netherlands is 16. Junior health minister Martin van Rijn said in November that he plans to introduce legislation to increase the legal age to buy tobacco from 16 to 18. President Vladimir Putin has encouraged Russians to have more children, saying three per family should be the average, as he seeks to battle an acute demographic crisis upon returning for a third Kremlin term. The government touts the recent increase in birth rates as the product of a policy decision to reward families who choose to have a second child with cash bonuses and credits of around $10,000 that can be used to pay for housing or the child’s education. The country’s latest census, in 2010, showed that the population had shrunk by 2.2 million people since 2002, to 142.9 million. b) Some soldiers have said the regiment and its traditions should come before Mr. Bhullar’s personal beliefs. Bhullar’s fans have called him ‘a credit to the nation.’ Mr. Bhullar appears quite earnest and sincere in his religion, and his desire to be a Queen’s guard. What do you think? –Should the tradition of the Queen’s guard be changed for a soldier’s religious belief? –If so, should a Muslim woman who wears the niqab and wanted to wear her religious garb while on duty, or an Orthodox Jewish man who wanted to wear his beard and long side curls, with a traditional Jewish head covering be permitted to do so? c) A Sikh’s turban and beard are very much a part of who a Sikh is. The bearskin (hat) is very much a part of who a Buckingham Palace guard is. Who should give way to whom? Was the right choice made? 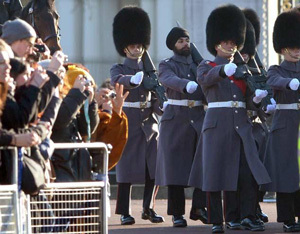 Which should have first priority with Buckingham Palace, the fact that he is a guardsman or the fact that he is a sikh? b) What is the difference between the Netherlands and Holland? b) What is the Russian government giving to families who have more than one child? c) President Putin credited the government payment programs for “stabilizing the population figures.” How do some demography experts refute President Putin’s assertion? A Sikh is a follower of Sikhism, a religion that originated in the 15th century in the Punjab region of India. Sikhism is the fifth largest religion in the world. The vast majority of Sikhs live in the Punjab, a part of northern India. Sikhs live in just about every major country around the world. Sikhs maintain a distinctive appearance. Baptized Sikhs keep five articles of faith with them at all times. Part of the religious duty is to keep every hair intact and unaltered. Men, wear turbans to keep long hair tidy. Women wear turbans or long silky scarves. Long hair is groomed daily with a wooden comb. A loose undergarment is worn for modesty. A steel bangle is worn as a sign of faith.